This is a thread for the "Downtown Lifestyle District", also cited as "Center City District" development proposed for downtown East Lansing. Calling the new project the “Downtown Lifestyle District,” the developers are proposing a set of twelve-story structures that would stretch all the way from Grand River Avenue on the south to Albert Avenue on the north. This would subsume the existing City Parking Lot #1 (the gated pay-lot across from HopCat) as well as the block of businesses that until recently held Conrad’s Grill and that still includes the Landshark Bar and Charlie Kang’s restaurant, as well as the newly-opened Lotsa Pizza. 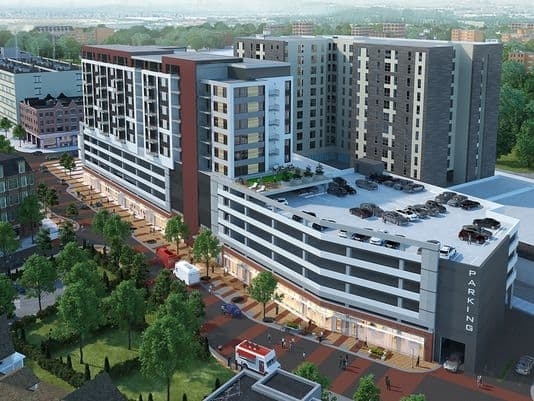 A Chicago developer is proposing to build a 12-story apartment building on East Grand River Avenue in East Lansing and a six-story age-restricted apartment building atop a six-story parking garage along Albert Avenue, city officials announced today. Pages 2-4 of http://eastlansing.granicus.com/MetaViewer.php?view_id=2&event_id=1344&meta_id=46349 explain the project in greater detail too. I love everything about this project. I hope that the parking ramp that does not have residential above it will be built to support more floors in the future if the demand is there. I guess if I were to really stretch for things that could be improved, it's to ask for a green roof on the buildings and a decorative cornice, though the latter doesn't appear to happen anymore. Given what it's replacing, it's all right, particularly since it'll largely be replacing a surface parking lot. The architecture could be a bit more inspired. I'm interested to see what it looks like from the "front" along Grand River. Yeah that's crazy. I think it's related to the desire to find opinions on both sides, which isn't always necessary. I think it's better than alright. The ground floor retail on the parking garage is what we were just talking about with the Lansing Center casino, and the downtown grocer is a game-changer for living downtown. This is a great project from everything I can see. It will take away the largest surface lot in downtown EL, add more non-student housing and more high quality retail, I'm happy with the scale of the project and I'm ok with the buildings it will be replacing. The architecture is nothing to fawn over but it's certainly nothing to complain about either. If this and the City Center II both get off the ground I'll begin having a lot more faith in the future of downtown EL. They have a slide presentation on the LSJ web site with more depictions. I have to say I like that it seems to be a different architect[than the one in REOtown] drawing this up! Will the voters get to decide on this project? It doesn’t look like it. The plan is not to sell any of the public land, which means the public gets no vote on a land sale. It’s unlikely East Lansing’s City Council will seek to use bonds for this, so there will be no public vote on bonds. That means the vote for this will be up to City Council. A minimum of three votes among the five City Councilmembers will be needed to approve this project. Height and traffic always come up as criticism with large scale development. But this development has some local business owners and they seems to be organized so that there are no substantial issues. It looks like this will be a smoother process. When do they want to begin construction? From the reading it seems like ASAP. I would guess around June at the earliest, though with the project being so large June seems pretty optimistic to me.